The students are generally aghast at this. Surely the romantic image of Bonhoeffer as the courageous Christian resister and martyr is too precious a treasure to diminish in this way? Well, I go on to explain, I say this because, as deeply inspiring as his courage and resistance are, for the contemporary church his theology is an even more exciting contribution. Or, more accurately, the two are so intertwined that to lose sight of the theologian in favor of some romanticized freedom fighter is to misunderstand both facets of Bonhoeffer’s life and the unstable yet unwavering integrity by which he fought to hold them together. Bonhoeffer died on the cusp of what he saw as his own theological breakthrough: relating some of his earlier writings on discipleship, particularly the ones that framed discipleship as departure from “the world,” with the growing sense in his later writings that Christians are called to be even more worldly than the average secular person—precisely because, in Christ, God goes deeper into the world than the world is in itself. His unfinished project as found in Ethics and Letters and Papers from Prison sought to bring together the poles of, on the one hand, deep formation in thick Christian practices characteristic of his time at Finkenwalde seminary and the chronicle of that experience, Life Together, with, on the other hand, a growing sense that Christians are called to be responsible by acting in the deep moral and spiritual gray areas in the world, trusting in God’s grace to forgive those whose responsibility causes them to become guilty of sin. Many of Bonhoeffer’s other activities—his pioneering ecumenical work, his engagement in youth ministry, and his ambiguous relationship to university teaching—have to be contextualized within this generative tension in order to be comprehensible. His was a Nicene-Chalcedonian christological hermeneutic of Christian formation through and through, which made him more theologically daring than most of his ostensibly more modern peers. Thus, toward the end of his life, Bonhoeffer’s theology and his engagement in resistance to Hitler continued to merge in evocative ways. To capture the one requires elucidating the other so that a full portrait of this complex thinker can emerge. But as we know, three-quarters of a century after his death his legacy remains deeply contested. Did his longings for monastic-like community and strong doctrinal commitments indicate that he was on the verge of becoming Roman Catholic? Were his statements about “religionless Christianity” toward the end of his life signs that, as the “death of God” theologians thought, he was on the verge of some kind of atheism? Was he confessionally Lutheran through and through? Or some hybrid of multiple possibilities that he himself was only beginning to understand at the time of his death? In the myriad biographies of Bonhoeffer available to the English-speaking church (and here I am restricting myself to those available at present in English), the ability to tell the story of Bonhoeffer’s life and his theology in an exciting way has been difficult to pull off. As we will see, a number of Bonhoeffer biographies do a good job of telling his relatively brief life story, while others are good at engaging in theological analysis of his texts. However, we are still waiting for an up-to-date biography that does both well. This means that Bonhoeffer fans will need to read at least a few biographies in order to get a full picture of his career and, especially, to understand the import of his theological texts. Of course, interested readers would do well to consult his texts directly. Fortress Press now having recently completed the seventeen-volume translation of Bonhoeffer’s Works, including reliable translation choices and critical apparatuses, that task is now much easier to do. What follows is one teacher’s highly opinionated survey of some key Bonhoeffer biographies, with particular suggestions about how best to mix and match them to get different angles on this crucial theologian of the twentieth century. In many respects, the best theological biography of Bonhoeffer remains Eberhard Bethge’s Dietrich Bonheoffer: A Biography. He wrote it in 1967 as an effort to rehabilitate the image of Bonhoeffer in the English-speaking world, since immediately after the war in both America and England Bonhoeffer was dually—and contradictorily—damned as both a Nazi who served in the German army and as a treasonous spy who conspired to commit the assassination of a legitimately elected leader. This lengthy examination of Bonhoeffer’s theological formation and trajectory still features a variety of sensitive and helpful readings by a man who was no theological slouch himself. Interestingly, Bethge served as Bonhoeffer’s confessor as well as his closest friend throughout his adult life, so one may speculate on how Bethge chose to disclose certain things while withholding others based on his respect for the seal of the confessional. Bethge’s biography is hampered largely by age. He did not have access to a number of letters and other documents available to current scholars, and his very brief commentary on Bonhoeffer’s engagement to Maria von Wedemeyer is somewhat unsatisfying to contemporary taste. 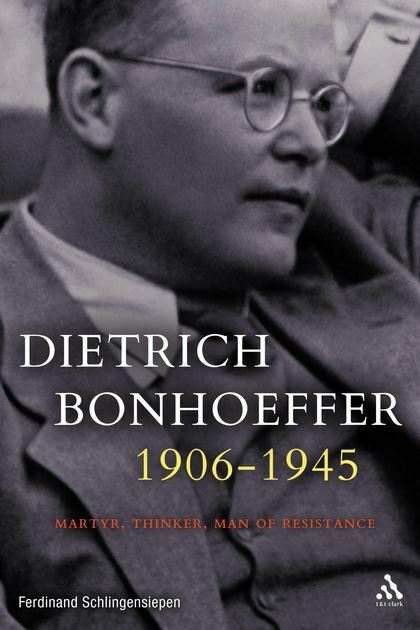 A recent biography that takes more of these into account, and with perhaps the greatest level of historical detail and accuracy, is Ferdinand Schlingensiepen’s Dietrich Bonhoeffer 1906–1945: Martyr, Thinker, Man of Resistance. This book is used by many Bonhoeffer scholars as a “safe” choice. Schlingensiepen sticks largely to the undisputed facts of Bonhoeffer’s life, and his reading of the theological texts, though often briefer than one might like, is hermeneutically conservative in admirable ways. The drawback that my students identify is that, compared to some other books, Schlingensiepen’s matter-of-fact reportage can make for a fairly dry read in places, especially for those coming to Bonhoeffer for the first time. The issue may also lie in a somewhat wooden translation of the German. That said, given the occasional excesses of other biographies, it is good to have Schlingensiepen on hand as a reliable reference. Similar virtues, albeit in much slimmer volumes, can be found in Renate Wind’s Dietrich Bonhoeffer: A Spoke in the Wheel and Christiane Tietz’s Theologian of Resistance: The Life and Thought of Dietrich Bonhoeffer. These two books, like Schlingensiepen’s, are largely straightforward and reliable, albeit not particularly groundbreaking or provocative. Tietz’s book has the virtue of encompassing the full critical apparatus of the Fortress series, in conjunction with which her book was published, so it is a particularly helpful companion piece to either the critical or the new reader-friendly editions (cheaper, fewer footnotes) of the original sources published in the Fortress series. The opposite strengths and weaknesses are on display in Charles Marsh’s Strange Glory: A Life of Dietrich Bonhoeffer. Marsh is an excellent scholar of theology and American religion as well as a captivating writer. He adroitly picks up on Bonhoeffer’s growing awareness of his own privilege and many shortcomings; Marsh’s is the most admirably “human” Bonhoeffer. As a scholar of religion in the American South, Marsh is particularly strong in his portrayal of how Bonhoeffer’s travels in the South impacted his sense of racism and social justice—and in fact salvaged some of the political theology themes that he learned at Union from Reinhold Niebuhr but initially dismissed until he saw deep structures of racism in action. Marsh also shows how Bonhoeffer’s pastoral instincts ruled his theology in ways that led to consistent favoring of the church over the academy proper, something remarkable for such a theological wunderkind. Marsh’s biography has been critiqued on two key fronts. Some have pointed out that his emphasis upon Bonhoeffer’s travels in the South inadvertently diminishes the even more radically transformative effect of his time at Abyssinian Baptist Church in Harlem, where he rediscovered the vitality of the gospel as it was preached apart from Protestant liberalism and demythologizing tendencies, yet deeply connected to social currents of the day, particularly racism and economic exploitation. Reggie Williams’s excellent recent monograph, Bonhoeffer’s Black Jesus: Harlem Renaissance Theology and an Ethic of Resistance, is the single best exploration of how Bonhoeffer’s encounter with the rich theology of Abyssinian Baptist and the Harlem Renaissance may have fueled his later resistance efforts in Germany. The second point on which Marsh has been critiqued is his strong implication that Bonhoeffer harbored romantic feelings toward his aforementioned friend and biographer, Eberhard Bethge. While it is clear that Bonhoeffer’s feelings of spiritual and filial connectedness to Bethge were unique, and that the level of emotional intensity between them was uneven (with Bonhoeffer by his own admission being a more high-maintenance friend than Bethge), Marsh’s largely veiled speculations on this front tend to be more of a distraction than an asset in an otherwise fine read. All told, a combination of Schlingensiepen, Tietz, Marsh, and Williams is what I generally recommend to students in my Bonhoeffer seminar if they want a comprehensive and evocative picture of the man’s life and work. I also direct students to the excellent documentary by Martin Doblmeier, Bonhoeffer: Pastor, Pacifist, Nazi Resister, which features a number of interviews with Bethge, other students of Bonhoeffer’s, family members, and so on, as well as chilling footage of the Nazi takeover of German institutions. The most controversial Bonhoeffer biography to have come out in recent years is Eric Metaxas’s Bonhoeffer: Pastor, Martyr, Prophet, Spy. Metaxas, who by his own admission does not read German, wrote his biography largely as an effort to make Bonhoeffer appealing to American Evangelicals whose theology encompasses engagement in various culture-war issues such as sexuality and abortion. In so doing, he indexes Bonhoeffer to the resistance of contemporary conservative Christians against progressive stances on these issues, going so far as to essentially accuse contemporary liberals of watering down Christian theology in the same manner as nineteenth-century German liberalism did such that the theological and social tyranny of Nazism became thinkable. Metaxas, who in addition to other bestselling popular biographies of figures such as Luther and William Wilberforce has written for such programs as VeggieTales, is a talented wordsmith. His biography has clearly done a great deal to renew interest in Bonhoeffer among conservative Christians especially. However, as a number of Bonhoeffer scholars have pointed out, Metaxas assumes an “omniscient” view of what Bonhoeffer was thinking at any given point in time, and this strategy is almost always in service of recruiting Bonhoeffer as a warrior on his side of the contemporary culture wars. This, it must be said, is a particularly distasteful exploitation of the atrocities of Nazism. While scholars of Bonhoeffer might be gratified for the increased attention to his legacy brought by Metaxas’s notoriety, the biography itself should be distrusted. Lutheran readers of Bonhoeffer may further be interested in two excellent recent monographs. One of the most exciting young Bonhoeffer scholars in the English-speaking world is Michael P. DeJonge, and his work Bonhoeffer’s Reception of Luther will become the standard treatment of the subject. Bonhoeffer’s relationship to Luther was complex. Even as he self-consciously mined the reformer’s insights on grace and the futility of human attempts to become righteous, Bonhoeffer’s keen insights into how much of the Lutheranism of his day had degenerated into bourgeois citizenship ethics made him eager to find a Luther as theologically daring as his other key mentor, Karl Barth. DeJonge paints this picture with exegetical verve while also giving the best discussion I’ve seen of Bonhoeffer’s modification of two-kingdoms theory, orders of creation, and other then-standard Lutheran tropes. Meanwhile, H. Gaylon Barker’s The Cross of Reality: Luther’s Theologia Crucis and Bonhoeffer’s Christology is magisterial to the point of exhaustiveness in terms of its zeroing in not only on the legacy of Luther’s theology of the cross in contemporary theology, but also on how Bonhoeffer’s entire theological project can be read as an extended meditation on discipleship as formation in the way of the cross. Martin Marty makes the case in a somewhat breezy yet ultimately interesting recent book that traces how Bonhoeffer’s Letters and Papers from Prison were received in such contexts as South Africa long before they found any vital hearing in either Europe or North America. Marty’s Dietrich Bonhoeffer’s Letters and Papers from Prison: A Biography is worth reading for insights into how the reception history of Bonhoeffer’s most elusive text set the stage for the various contrasting lines of interpretation to which Bonhoeffer’s life and work have been subjected. Absent a living man, a mysterious text became the hinge for a host of disparate movements centered around his example—no unfamiliar situation to Lutherans, or any other Christians, for that matter! As mentioned above, Bonhoeffer’s theological agenda tended to be driven by pastoral concerns, and a surprisingly delightful case for the centrality of youth ministry to both his life and theological vision has been made by Andrew Root in his Bonhoeffer as Youth Worker: A Theological Vision for Discipleship and Life Together. While much of Root’s agenda, as the title indicates, has more to do with recommendations for contemporary youth ministry rather than exegesis of Bonhoeffer per se, he is clearly right that Bonhoeffer’s time as a youth pastor in inner city Berlin has been underrated as compared to Abyssinian Baptist, Finkenwalde, and so forth. Two other key recent titles are worthy of note. Paul R. Hinlicky’s Before Auschwitz: What Christian Theology Must Learn from the Rise of Nazism is not about Bonhoeffer directly, but it is an extremely nuanced and sobering look at the theological backdrop against which the idolatries of German Christianity were able to take root in the soil of desiccated ecclesiastical and theological structures of twentieth-century Germany. It also includes the most thorough account I’ve seen of Adolf Hitler’s “theology.” While Hitler was famously a despiser of the Christian church, his own idiosyncratic mix of occult, nationalist, and pagan tendencies was a key influence upon the broader Nazi program toward the gradual co-opting of the German church. Finally, Barry Harvey’s Taking Hold of the Real: Dietrich Bonhoeffer and the Profound Worldliness of Christianity offers the most sober and textually defensible account of how the later Bonhoeffer’s thinking around “this-worldly” or “religionless” Christianity might have emerged organically from his thought as a whole. Despite this profusion of good titles, there is quite a lot yet to be done. While the wealth of excellent biographical and theological reflection on Bonhoeffer is evident in the books noted here, as well as countless others, there remains something elusive about bringing the various desiderata of a quality theological biography—good storytelling, nuanced and expert reading of theological texts, historical rigor without undue speculation—into alignment when it comes to this particular historical figure. In an era once again beset by genuine threats of fascism and tyranny, it is virtually impossible for Bonhoeffer’s example not to be overdetermined by the need we feel today to seek heroes of resistance. Meanwhile, Bonhoeffer’s own formidable theological acumen means that his best texts resist either summary or incorporation into a broad biographical narrative without remainder. This may mean that, rather than longing for one single biography comprehensive enough to supersede the need for contrasting portraits, Bonhoeffer scholars and fans alike may be best served by embracing the interpretive contestation as a fitting tribute to the man’s complexity and unfinished projects. If that is the case, then we can hope that explorations into such topics as his uneven appropriations of monastic practices, his critical yet ultimately affirming relationship to the Lutheran Confessions, and the specific relationship between thick church practices such as baptism and Scripture reading on the one hand with “worldly” immersion on the other will continue to yield fruit for both theologians and the church. Robert C. Saler is Associate Dean and Research Professor of Lutheran Studies at Christian Theological Seminary in Indianapolis, where he also serves as Executive Director of the Center for Pastoral Excellence. 1. Eberhard Bethge, Dietrich Bonheoffer: A Biography, rev. ed. (Minneapolis: Fortress, 2000). 2. Ferdinand Schlingensiepen, Dietrich Bonhoeffer 1906–1945: Martyr, Thinker, Man of Resistance (London: T&T Clark, 2012). 3. Renate Wind, Dietrich Bonhoeffer: A Spoke in the Wheel (Grand Rapids: Eerdmans, 1992). 4. Christiane Tietz, Theologian of Resistance: The Life and Thought of Dietrich Bonhoeffer (Minneapolis: Fortress, 2016). 5. Charles Marsh, Strange Glory: A Life of Dietrich Bonhoeffer (New York: Knopf, 2014). 6. Reggie Williams, Bonhoeffer’s Black Jesus: Harlem Renaissance Theology and an Ethic of Resistance (Waco: Baylor University Press, 2014). 7. Bonhoeffer: Pastor, Pacifist, Nazi Resister, directed by Martin Doblmeier (New York: First Run Features and Alexandria: Journey Films, 2003). 8. Eric Metaxas, Bonhoeffer: Pastor, Martyr, Prophet, Spy (Nashville: Thomas Nelson, 2011). 9. Michael P. DeJonge, Bonhoeffer’s Reception of Luther (Oxford: Oxford University Press, 2017). 10. H. Gaylon Barker, The Cross of Reality: Luther’s Theologia Crucis and Bonhoeffer’s Christology (Minneapolis: Fortress, 2015). 11. Martin Marty, Dietrich Bonhoeffer’s Letters and Papers from Prison: A Biography (Princeton: Princeton University Press, 2011). 12. Andrew Root, Bonhoeffer as Youth Worker: A Theological Vision for Discipleship and Life Together (Grand Rapids: Baker Academic, 2014). 13. Paul R. Hinlicky, Before Auschwitz: What Christian Theology Must Learn from the Rise of Nazism (Eugene: Cascade, 2013). 14. Barry Harvey, Taking Hold of the Real: Dietrich Bonhoeffer and the Profound Worldliness of Christianity (Eugene: Cascade, 2015).